Digital marketing may sound dry, but your blog posts don’t need to be. When people come across content that entertains them, they’re likely to share it on social media channels such as Facebook and Twitter. Producing entertaining content can be difficult, but if you can make it work, it can be a very effective type of blog post. Following are five blog post types that entertain. Stories are engaging, which is why they make effective blog posts. In this article, you tell a story that would entertain your market. Story posts don’t have to be epic pieces of content; not all stories have to be complex. For example, commercials create entertaining stories all the time in fewer than 60 seconds. In the satire post, be humorous through the use of irony or extreme exaggeration. This kind of content works well with timely issues such as politics or sports. The Onion, which is a farcical newspaper featuring world, national, and community news, is a prime example of a digital media company creating satirical content. For the cartoon post, center your article around a cartoon that makes your audience laugh and think about issues and events in your niche. This type of post works well as a series, and you can run it daily, weekly, or monthly. 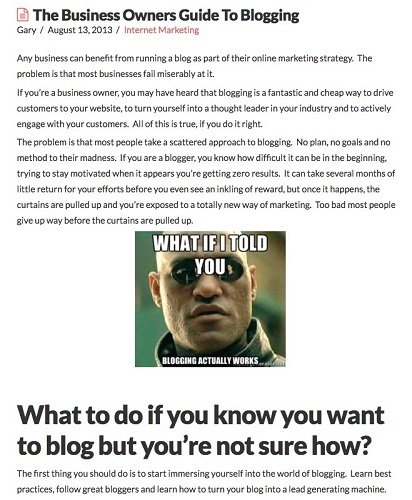 Small Business Marketing Blog centers its blog article around a meme. In the parody post, you create content that imitates a well-known person, product, or media property in your niche. Be sure to exaggerate the person’s or item’s strengths and shortcomings in your content.